A week or so ago, in a story on the radio on the tariffs Trump was announcing on steel and aluminum imports from most of the rest of the world, the reporter interviewed an Iowa pig farmer. The farmer explained what a bind the tariffs put him and other pig farmers in, given that China in particular was certain to retaliate with tariffs on a laundry list of American products, including pork. How the loss of the China market for Iowa pork meant having to load more pork product on other markets—such as the American domestic market—that already had more than adequate pork supply. Causing pork prices to drop, reducing pig farmers’ revenues, and ultimately pork production, and so corn and soybean production—corn and soybeans being main ingredients in pig feed—and farm equipment—tractors and trucks—sales and manufacturing, and so forth and so on. In other words, everything’s connected. Which is the main message of Mizin Shin’s artwork currently on show at Buffalo Arts Studio. Except illustrated with cows and chickens instead of pigs. One of her large wall installation works consisting of multiple little icons of cows and chickens, among icons of farm crops—corn and soybeans again certainly, main ingredients also of cattle and chicken feeds—and farm equipment and facilities used to harvest and store feed and other crops—tractors and combines and corn cribs—and process equipment used to process food product and get it to urban markets. And the further message, that if everything’s connected, the system becomes a feedback loop, which occurs when system outputs are routed back in as inputs, for ultimate increased effectiveness of the system, for good or ill. Feedback loop is harder to see in a static work of art—even about dynamic processes—but seems more implicit. What Shin’s various works show explicitly are networks, in a range from concrete—the cows and chickens and farm production work—to abstract. 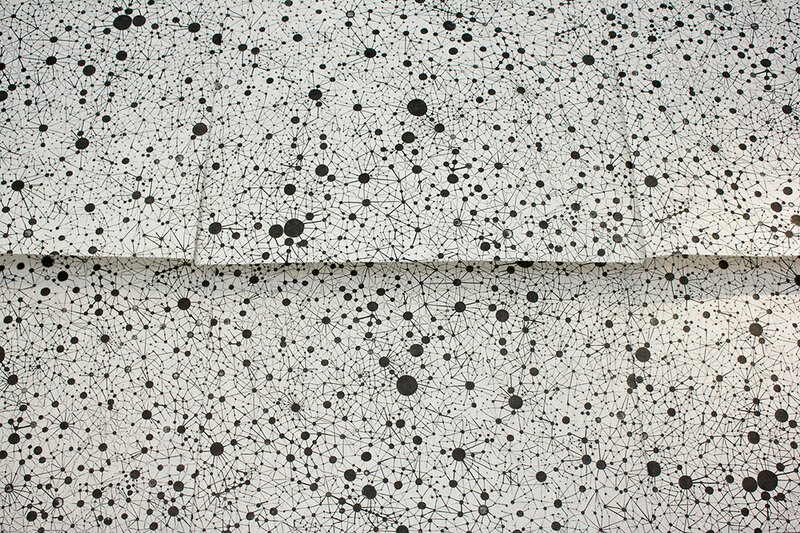 Several large and small dots and interconnecting lines works—like a Jackson Pollock if he took the next step and with a pen or pencil joined his dots—including a wall-hanging sheet work—or actually just off the wall, about six inches from the wall—with black dots and perforation dots and lines, part of the aesthetic effect of which is the shadow subdued reiteration of the sheet pattern on the wall behind it. The Mizin Shin and Chuck Tingley exhibits continue through May 5.